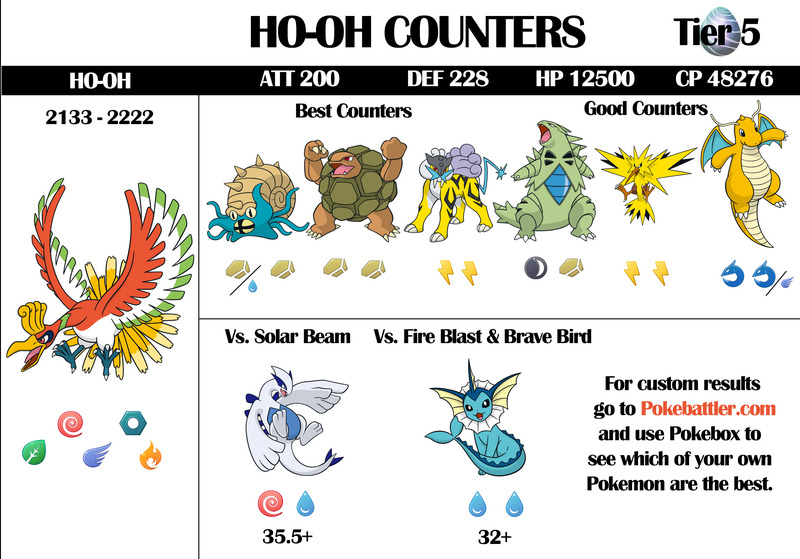 Printable High-Resolution Ho-Oh Counter infographic Download. Niantic has just nerfed Ho-Oh’s stats, which is exactly what they did right before they released Mewtwo, so Pokebattler is betting that Ho-Oh will be released soon too. Considering we have yet to receive any exclusive raid passes (Grrrrrrr), we are hoping that Ho-Oh isn’t an exclusive raid and is just a Tier 5, but we have a feeling that won’t be the case. Either way, the time has come for a Ho-Oh raid guide infographic! As usual, the infographic is intended to be easy to use. The best Pokemon are to the left. The best move types are under each Pokemon with quick attacks followed by charge attacks. The smaller icons with a slash to the right of a larger icon mean that type of move is decent, but not as strong as the large icon to the left of it. 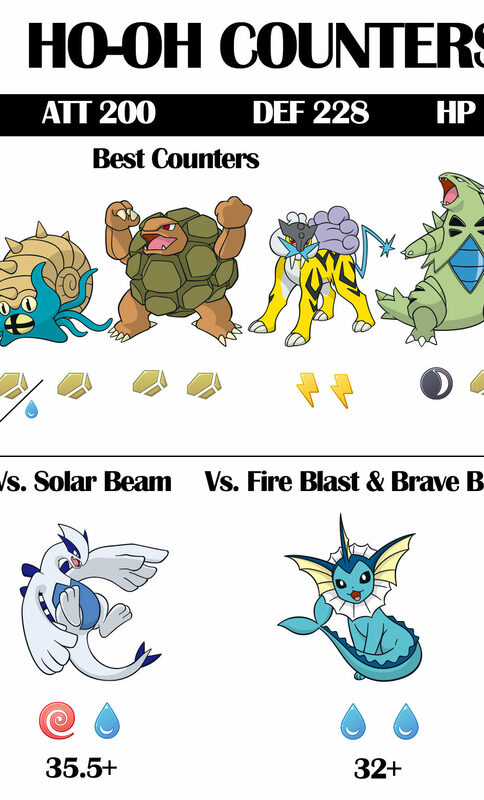 For example, Omastar double rock is the best, but Omastar with Water Gun and Rock Blast/Ancient Power still makes the top attackers list. Ho-Oh is a pretty strong boss and will need around 6 30+ level players with strong Pokemon to take him down without dodging or rejoining. Its theoretically possible to beat him with perfect dodging and 3 players but I don’t expect to see it happen. 4 trainer kills will definitely happen with rejoining but will be fairly difficult. He is significantly harder than most other raids, similar to Mewtwo in many ways. The best moves against him are rock (double effective), electric and water. Unsurprisingly, neutral power house moves like Outrage are also quite effective. Once again, a double rock Golem proves to be useful as a legendary raid counter. If you’ve been active in raids, you should already have a few of these by now. Don’t bother with mud Golem, it needs to be double Rock moves to be strong against Ho-Oh. Stone Edge is a bit stronger but Rock Blast is still good as well. Hopefully, you’ve managed to get a few good Raikou by now, depending on your region. So far he’s proven to be the most useful of the legendary beasts. All his moves are electric, so you don’t have to worry about using any TMs on him. If you happen to have a very high level one (35.5) with 15 defense or higher, he pops up to the #1 spot by virtue of taking 1 less damage from Extrasensory. This is enough to get an extra special off more often than you might think. Tyranitar once again makes the list as a very strong Pokemon with a rock move. The double effectiveness easily outclasses crunch as usual for the birds. As usual, there are a few important breakpoints that can significantly affect the rankings. Raikou as mentioned at level 35.5 with 15 defense moves up to #1 based on his survivability against Extrasensory. Defensive breakpoints aren’t as common but when they kick in they can sometimes make a big difference as in this case. Ho-Oh is a very difficult boss and you will most probably not be getting 3 bonus balls without advanced trickery. This infographic is a great general guide, but for more precise customized results, check out our customized raid guide. We’ve recently added the unknown move set feature, perfect for the first time you do a raid. Or if you’ve already figured out the move set, you can select each move set for even more accurate results. And our Pokebox feature lets you upload your own Pokemon for truly personalized raid results. Thanks for reading! Happy hunting. I have already got all new gen 3 pokemon.